The Kona Crime Prevention Committee recognized Kona Patrol Officer Jason Hamada as “Officer of the Month” for November in a luncheon ceremony on November 7 at Huggo’s restaurant in Kailua-Kona. Hamada was honored for his “tenacity” in capturing an escaped prisoner. 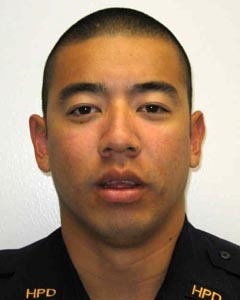 Hamada was one of several officers dispatched to the Kailua Pier on an anonymous tip that the 21-year-old escapee from Hale Nani was in the area. Hamada made contact with the suspect, who provided a fictitious name. As Hamada positively identified the escapee by an arrest photo on his phone, the man ran away. 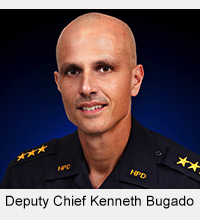 A group of officers chased the suspect about a quarter-mile, with Hamada running in the lead. 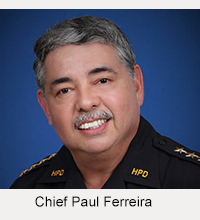 Although the suspect was desperate to evade arrest and outran several other officers, Hamada ran him down and, after a brief struggle, subdued him. The suspect was arrested for escape and returned to Hale Nani.